Costa Rica is the modern, vibrant capital of Costa Rica, where rich history happily blends with modern commerce and architecture. 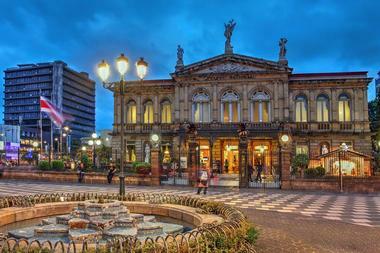 The city’s colonial past shows in beautiful ornate buildings, such as the neoclassical National Theatre. The city is also the country’s cultural center and has a large number of museums that preserve national culture and history, such as the Costa Rican Art Museum, the Museum of Contemporary Art and Design, the National Museum of Costa Rica, and the La Salle Natural Sciences Museum. The beautiful urban parks are spaces where locals go to exercise, have a picnic or a lunch break, destress, or meet friends. The most popular are La Sabana and downtown Parque Nacional Simón Bolívar. The Costa Rican Art Museum is the major national art museum, with the biggest collection of state-owned art in the country. 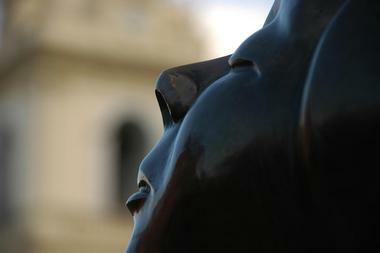 It contains more than 6,400 works of art by Costa Rican and international artists. Its permanent collection includes sculptures, paintings, engravings, watercolors, drawings, photography, and other media covering the period from the mid-19th to the early 21st century. The museum is also engaged in extension programs, traveling exhibitions, and exhibitions abroad. The building in which the museum is located, built in the late 1930s, is also a work of art, one of the finest examples of the neocolonial style of architecture. The museum has a part of its collection in its outdoor exhibition space. La Sabana Park is a perfect urban park, offering a space for all sorts of outdoor activities from jogging to tennis. Surrounded by modern skyscrapers in the heart of the city’s business district, the park is an oasis where busy professionals come in the morning for an early jog or at noon for their lunch break. Any time of the day someone is biking, jogging, picnicking, rollerblading, or just chatting with friends on one of the many benches. Its lively atmosphere and lush greenery make the park similar to what Central Park is to New York, a living, breathing lung for the city. Although opened in 1977, the park has a long history. 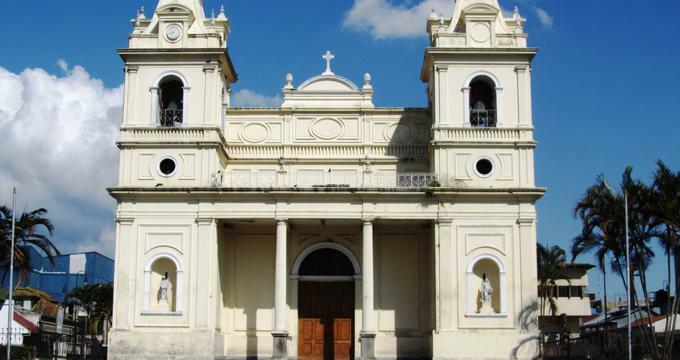 The space on which it is located was donated more than 200 years ago by a priest named Manuel Antonio Chapuí, who wanted the city to have a peaceful, relaxing oasis. The Jade Museum is an archeological museum in San Jose founded in 1977 by Fidel Tristan Castro. The museum has an extensive and diverse collection of pre-Columbian artifacts that include stone tables, ceramics, adzes, ceremonial heads, and other decorative pieces, covering the period from 500 BC to 800 AD. The museum collection covers not only a large range of jade artifacts and jewelry but also uses them to explain why the precious stones were so revered in pre-Columbian times as well as how they were traded and used. The museum occupies only one floor of its current building and has only five rooms, each covering a different archeological and anthropological theme. Besides jade, the museum has a collection of ceramic, stone, and gold objects and much more. Located in the Costa Rican Science Center Complex in San Jose, the Children’s Museum is an interactive, hands-on museum in which kids can play, laugh, learn, explore, and discover everything from astronomy to ecology and the science of everyday life. One of the most popular exhibits is an earthquake simulator. There are more than 40 fascinating exhibits that both kids and parents enjoy. 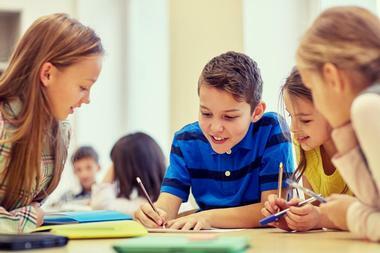 Kids get a kick out of learning that the building in which the museum is located used to be an old military prison that was closed in 1979, long before it became home to the Children’s Museum. There is an exhibit that showcases the life and suffering the prisoners endured while incarcerated within the walls of what is today a fun, cheerful place. 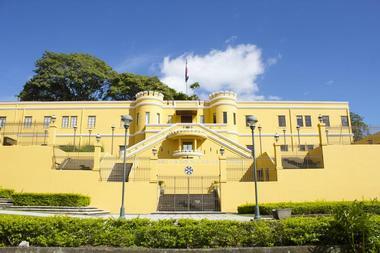 The National Museum of Costa Rica is located in San Jose, across the road from the country's Legislative Assembly, in the 1917 Bellavista Fortress. The fortress was used historically as military barracks, specifically during the Costa Rican civil war in 1948. Tourist guides like to point out the hundreds of bullet holes in the fortress walls. Before occupying its current location, the National Museum, which opened in 1887, was located in the Universidad de Santo Tomas. It was established with the goal to "deposit, classify, and study natural and artistic products." The museum’s mandate is research, education, and the protection of national cultural heritage. Among the most interesting and most popular exhibits is an exhibition of pre-Columbian art and artifacts that showcases the life and culture of country’s ancestors from 12,000 BC to 1500 AD and the arrival of the Spanish. Some of the most fascinating exhibits are a 2,500-year-old jade carving shaped like a seashell as well as arrow points, pendants, necklaces, and earrings. The Museum of Contemporary Art and Design is a Costa Rican museum that specializes in contemporary art and design by Central American artists but also includes international artworks. The museum is located in downtown San Jose in the building of the National Cultural Centre in the Ministry of Culture and Youth. The museum’s goal is to promote the current trends in Central American contemporary art and design and to show the relatively similar trends in art and design in Latin America and abroad. The museum occupies about 1,200 square meters and includes four spacious exhibition rooms, a modern auditorium, and an open-air space for art installations, various performances, and other events. 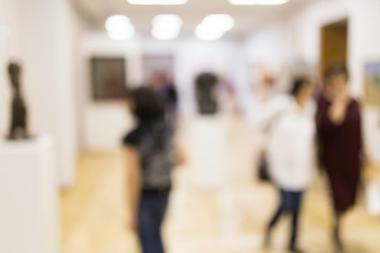 The museum’s permanent collection has over 500 works from renowned or emerging national and international artists. 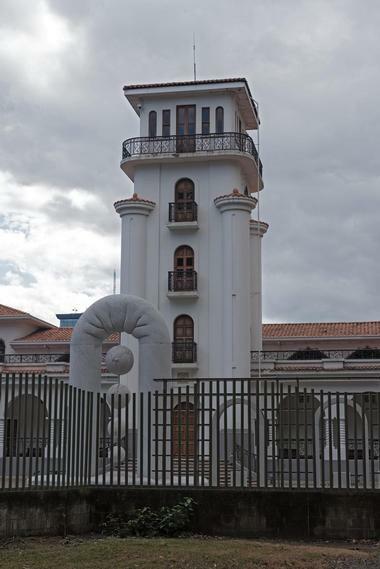 Located in downtown San Jose near the Parque La Sabana, the La Salle Natural Sciences Museum was founded in 1960 by Brother Eduardo Fernandez Barcena, a professor at the former Colegio High School. 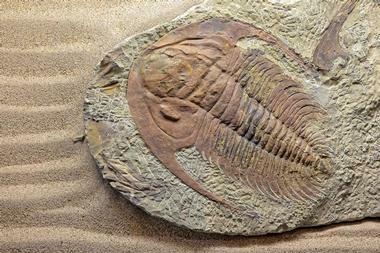 The museum collections include exhibitions on paleontology, zoology, mineralogy, and other related fields. The museum has more than 65,000 exhibits, with 55,000 on permanent display. These include birds, fish, reptiles, insects, shells, corals, mammalian fossils, dinosaur skeletons, and much more. The collection of stuffed animals includes grouper fish and a huge leatherback turtle. One of the most significant collections is an exhibition of blue morpho butterflies. 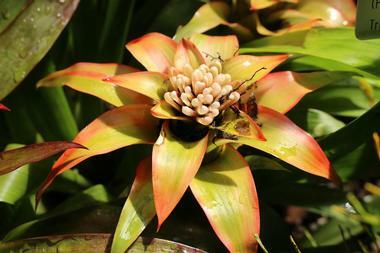 The museum is surrounded by a beautiful garden with exquisite, lush tropical plants and live turtles that wander freely around. The San José Central Market is a beautiful old market located in downtown San Jose, established in 1889. Its diverse stalls and shops occupy the entire block on Avenida Central, not far from Parque Central. The market is a maze of narrow alleys with more than 200 small and big shops, stalls, and eateries of all kinds. You can find just about everything you might need for a great meal: fish, meat, fruits, vegetables, great local coffee, herbs, cooked food, and much more. There are also flowers, snakeskin boots, souvenirs, saddles, and local handicrafts. 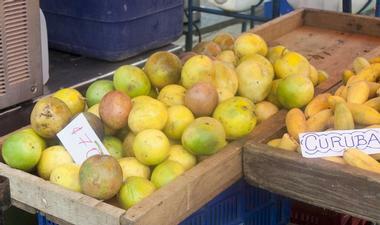 It is lively and fragrant and is a place where locals and tourists happily mix. Parque Nacional Simón Bolívar is a zoo and botanical garden that spreads out over 14 hectares in downtown San Jose. 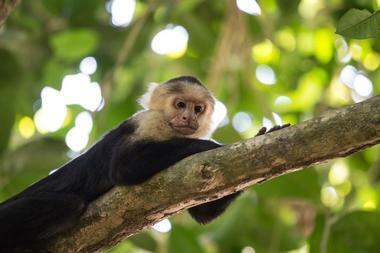 It is the oldest park of its kind in Costa Rica. All animals that live in the zoo were found injured, have been orphaned, or have been disabled. When possible, they are nursed back to health before being released into their natural environment. The zoo started its life as a plant and animal garden established by Swiss botanist and naturalist Henry Pitter in 1884. Today, the zoo has 30 species of birds, 11 species of mammals, two species of frogs, 10 species of reptiles, and one species of fish – koi carp. Some of the most interesting animals in the zoo are different species of turtles, the green vine snake, emperor boa, fer-de-lance, tropical rattlesnake, American crocodile, strawberry poison frog, spectacled caiman, and blue-sided tree frog. The National Theatre of Costa Rica is located in the heart of San Jose and has been entertaining San Jose residents since 1897, when it opened with a sold-out performance of Goethe's Faust. Today, the theatre has several performances a week and is home to the National Symphonic Orchestra. The theater building is recognized as one of the finest examples of neoclassical architecture in San Jose and is one of the city’s most important historic buildings. Its original ornate interior and lavish furnishings have been meticulously restored and preserved. The façade of the theatre is decorated with statues of Ludwig van Beethoven and Calderón de la Barca and near the entry is a statue of Frédéric Chopin. The interior is decorated with the mural Allegory of Coffee and Bananas created by Aleardo Villa.